Apple rebounded modestly in pre-market trading Thursday as investors reacted to the unveiling of three new iPhones, as well as a perceived emphasis on a new AppleWatch, at the tech giant's annual gala event at its headquarters in California. Welcome to the new iPhones. Wall Street digs the new iPhones. Apple Inc. (AAPL - Get Report) rebounded Thursday as investors reacted to the unveiling of three new iPhones, as well as a perceived emphasis on a new AppleWatch, at the tech giant's annual gala event at its headquarters in California. The world's most valuable company revealed three new additions to its smartphone lineup, including a 6.5-inch display iPhone XS Max which will retail for $1,099 and represents the biggest screen-size change in four years. 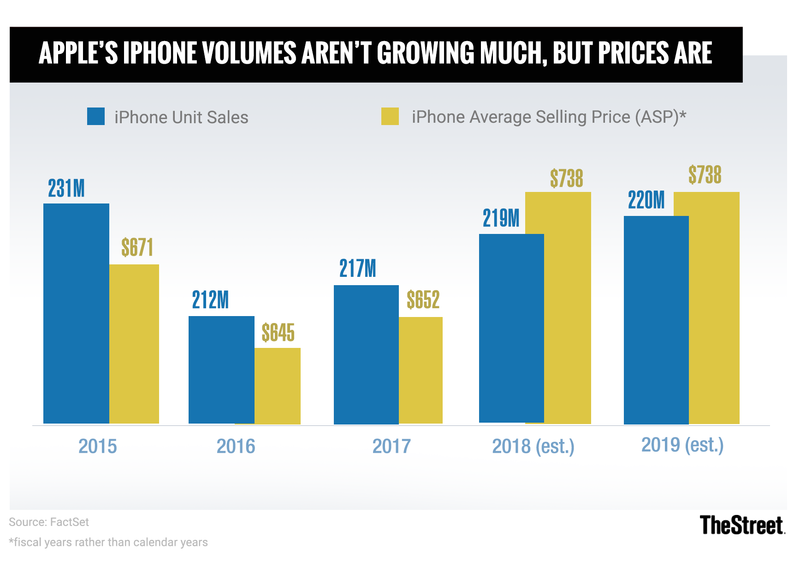 Apple also tweaked its current iPhone suite by adding two more models -- the XL and the XS -- which will collectively raise the average selling price for its most important product to around $800. Interestingly, however, Apple chose to kick-off the event at the Steve Jobs Theater with its new, and larger, AppleWatch, a device that appears more focused towards an aging, health-conscious consumer that could add a new dimension to Apple's traditional customer base. Action Alerts PLUS holding Apple shares were marked 1.6% higher in early trading Thursday and changing hands at $224.68 each, a move that more than erases yesterday's 1.2% decline and gives the stock a year-to-date advance of just over 31%. Several stocks in Apple's European supply chain were also stronger in the opening hours of trading Thursday, with Austria-based AMS AG, (AMSSY which earns an estimated 35% of its revenue from chip sales to Apple, was marked 2.76% higher in the opening hour of trading, while Frankfurt-listed Dialog Semiconductor plc (DLGNF gained 1.52% and STMicroelectronics (STM - Get Report) jumped 2.6% in Amsterdam. Some analysts noted that the larger-sized iPhone XS Max would not only allow the group to increase its average selling price in a flatlining smartphone market, but would also present a solid and direct challenger to Samsung Electronic's (SSNLF Galaxy X9, particularly in the fast-growing market in China. Global smartphone demand, however, appears to be contracting, with market research group IDC estimating the global market will shrink 0.2% this year before growing modestly between 2019 and 2022 as 5-G networks are rolled out around the world. Smartphone shipments over the three months ending in June, in fact, were down 1.8% from the same period last year, according to IDC's 'Worldwide Quarterly Smartphone Tracker', with vendors shifting 324 million units. Apple's share of that declining market, in fact, slipped as well, with China's Huawei moving 54.2 million phones to move into second place on the global chart behind Samsung . TheStreet's Eric Johnsa notes that "Apple is intent on keeping XR sales from cannibalizing XS sales, even as it prices the XS and XS Max at healthy premiums." "There's some risk that this strategy will ding iPhone unit sales, which were up just 1% annually last quarter. However, considering how iPhone X sales helped Apple's iPhone average selling price (ASP) rise by $118 annually last quarter to $724, the company has its reasons for pricing and segmenting its high-end lineup the way it has."